Every room in the home, especially the kitchen, improves with a little organisation, a lick of fresh paint and new implements. Here are some great ways to create a bright and cheery kitchen, even in the tiniest of apartments. Plain or plastic cabinet pulls often highlight the problem places in the kitchen, so why not breathe some new life into the hardware? Check out DIY stores and vintage shops to find replacement hardware that will give the kitchen a fresh and welcoming look. But don\’t stop with the cabinetry; give the interior of the cabinets a facelift as well. Go ahead and swap those dingy and drab drawer and shelf liners with decorative options. For a real pop of pizazz, why not wallpaper the inside of the cabinets for a little surprise every time someone reaches for a dish. It\’s amazing what fresh linens and a new rug can do for a small kitchen. If a complete colour overhaul isn\’t a possibility, select a few dishtowels that make a statement or put brightly coloured teacups up on the exposed shelves. A decorative and fun rug will soon cover up a dingy floor or drab tiles and while a few coats of fresh paint will always brighten up a kitchen, adding a few fun posters or prints will provide a revitalising spin. Get creative with storage and have some fun! Anyone with a small kitchen already knows that storage isn\’t always plentiful. Building a small kitchen island is a great way to introduce more storage, while also adding valuable work surfaces. For especially tight spaces, make sure the island has wheels so it can be stowed out of the way when it isn\’t needed. Another great way to boost storage space in a small kitchen is to let the walls do the work. When planning cabinets, go ahead and use the full height of the room to ensure every centimetre is put to good use. If floor to ceiling cabinetry isn\’t an option, why not consider some open shelves or stylish hooks for unique and efficient storage solutions? Â Open shelves are great for displaying items such as Dartington glassware, vintage storage containers, pop-coloured plates and other decorative, but functional bits and pieces. There\’s no doubt that a kitchen illuminated by natural light is the brightest and cheeriest way to go, but unfortunately not every apartment has the benefit of lots of windows. It might also be the case that the kitchen is situated in the wrong part of the home. Â If there isn\’t much natural light coming into the room, be sure to paint the walls in a warm, light colour, such as a creamy yellow or blush. It is also possible to enhance existing light with windowpane mirrors, which reflect light into darkest spaces without any major investment. And, don\’t forget the under-cabinet lighting and room-enhancing light bulbs. 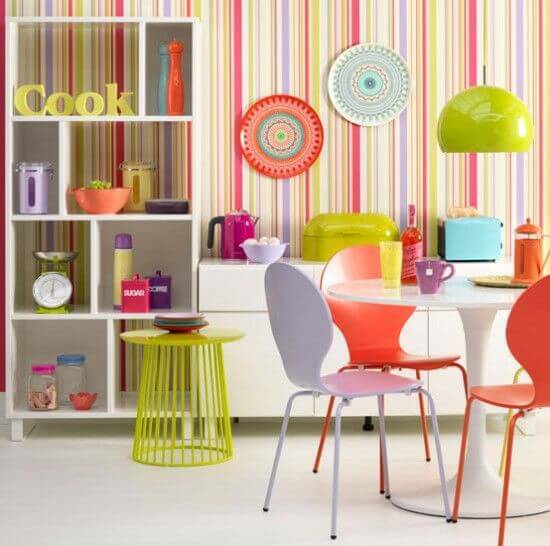 So, what\’s the hold up to creating a bright and cheery kitchen? Knowing that even the tiniest kitchen in an apartment can be fun and stylish should be motivation enough to get started right away.